Moving Beyond Asset Allocation – Where is your wealth located? ‘Wealth does not buy Happiness but more importantly provides choices and opportunities’. ‘Investing is not about beating the markets. It should be about your life’s goals: be it achieving safety for your family, a better life for your children, starting or expanding a business or creating wealth. Unfortunately, today we are often preoccupied with the wrong priorities – like increasing returns at all costs or finding the next star fund manager.’ These are two of the many statements that stand out in Ashvin Chhabra’s book, which is built on more than 10 years of research and is a furtherance of his paper ‘Beyond Markowitz’. He outlines and details the ‘Wealth Allocation’ framework and focuses on moving beyond Asset Allocation. He encourages investors to meet three needs – need for financial security, need to maintain standard of living and finally the need to pursue aspirational goals (wealth, positive impact and legacy). Before getting into a detailed discussion of the ‘Wealth Allocation’ framework, Chhabra notes three important aspects – People and their individual behavioural biases, Markets and their significant volatility and unpredictability, and Wealth in terms of Safety, Security and Aspirational goals. Chhabra’s Wealth Allocation framework combines modern portfolio theory teachings with behavioural finance to recommend simple yet powerful solutions to help investors achieve easier decisions. His approach calls for three distinct buckets – Safety bucket (Limits loss of wealth yet yields below market returns), Market bucket (for risk adjusted market returns) and the Aspirational bucket (targets above market returns yet carries risk of loss of capital). Under the framework, risk allocation must precede the selection of assets, investments and managers. On bucket portfolio benchmarking, Chhabra states that the safety bucket should be benchmarked with zero return after inflation, the market bucket benchmarked in accordance with Modern Portfolio Theory (MPT), and the Aspirational portfolio benchmarked to outperform standard market indices and where personal expertise may count. In terms of the asset classes, Chhabra recommends that an individual’s primary home (net of any home loans), Insurance, Cash, Short term government bonds be allocated to the Safety bucket while Stocks, Bonds and Alternative Investments (those used for hedging purposes) be allocated to the Market bucket. Finally, Angel Investments, stock options, leveraged investments in real estate, single manager hedge funds and opportunistic call options are to be allocated toward the Aspirational bucket. Importantly, private businesses, concentrated stock & Executive options (which may be treated different if hedged) belong in the Aspirational bucket. 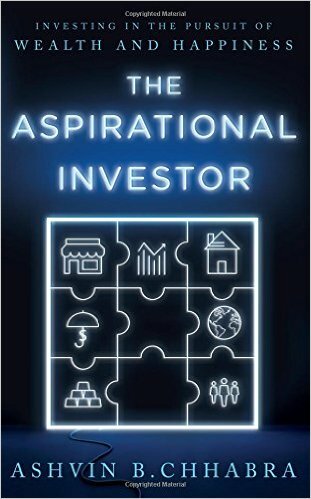 What I find interesting about Chhabra’s book is that he also explores the degree to which differences in individual asset attributes and holding rationale could result in allocating this asset in different buckets. Physical gold for instance may be held in the safety bucket, a gold fund in a market bucket and a large position in the aspirational bucket. Similarly, a primary home may be allocated to the safety bucket, a rental property in the market bucket while a large and/or leveraged real estate investment will go into the Aspirational bucket. Cash can be held in the safety bucket but may also form part of the market bucket as an opportunistic asset. Chhabra also evaluates other assets including Hedge Funds, Private Equity, Currency trading and Human Capital along these lines. Steps in the Wealth Allocation framework are goal creation and prioritization, conversion of goals to cash flows, allocation of goals to the portfolio buckets (Safety, Security and Aspiration), risk evaluation (financial and psychological ability to bear losses), Asset allocation and portfolio diversification, Stress testing and Analysis, Review and Rebalance. Chhabra also evaluates the issue of Asset Allocation complexity and believes that Beta is the dominating factor when the manager does not take big bets while Alpha can support the portfolio when managers are allowed to take concentrated bets. Strategy automation is also useful for making sure goals are met. Finally, the book analyses both the Endowment model and Warren Buffett’s Investing model of Asset Allocation via the lens of the Wealth Allocation framework. In this thoughts about the Yale’s Endowment model, Chhabra while acknowledging the success of its model notes that the model may be an incomplete one for individuals as it does not consider the behavioural biases of people. He also highlights Warren Buffett’s ability to achieve a ‘very sophisticated risk allocation’ a key input of which is large amounts of cash. To conclude, Ashvin Chhabra’s book is a valuable approach for investors to better understand their Wealth. It can also be very useful for advisers as the Wealth Allocation Framework is helpful for them to build investment portfolios which also address people’s behavioural biases. However, the Wealth Allocation approach presumes that the three portfolios (Safety, Security and Aspiration buckets) are uncorrelated and this may require further study. Recent financial market and economic developments may have also rendered historical analyses ‘less’ relevant. A key factor that has emerged recently is ‘liquidity’ risk which has affected seemingly liquid asset classes and which may matter more in the next market decline. PS: Ashvin B. Chhabra is a key note speaker for the India Investment Conference 2016 (#IIC16). His insightful approach to combining Traditional Theory of Portfolio Management and With Behavioural Aspects of Investing in a simple yet powerful – wealth allocation framework has been thought provoking in the Investment Management Industry. This entry was posted in Book Reviews and tagged #IIC16, @iaipcfa, Ashvin B. Chhabra, Book Review, CFA Institute, IAIP, Indian Association of Investment Professionals, Srinivasa Sharan CFA. Bookmark the permalink.